Summary: A father writes his children a letter in which he celebrates all the gifts that have been given to them by Steve, the large, unusual tree near their home. 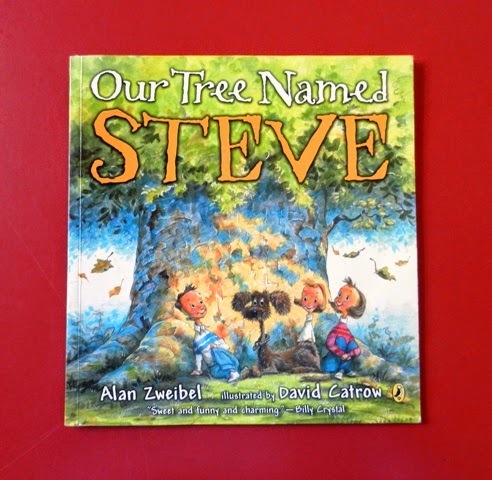 Steve (how the a youngest child said "tree") has become an important part of their family history: playmate, shelter, place of important milestones. Dad explains that the tree was knocked down by a storm but has been transformed into a tree house in another tree in their yard and will continue to nurture & protect them. Hanna’s Comments: This comical tale has such rich symbolic undercurrents and is full of potential for ties to scripture and spiritual transformation. You'll easily elicit conversations about important elements of family life such as play, ritual, protection, & sacrifice. Tie these to all that is holy at church and in nature. Allusions to Jesus' sacrifice are here as well as Steve as a symbol of God who is ever-present, ever-nurturing, and ever-loving. Idea(s) for Application: Consider reading this book at an Arbor Day Celebration, a Faith Family Festival, a Family Reunion, or in a church Sunday school class during Lent.